As you might guess from the name, the Bellini is an Italian classic. 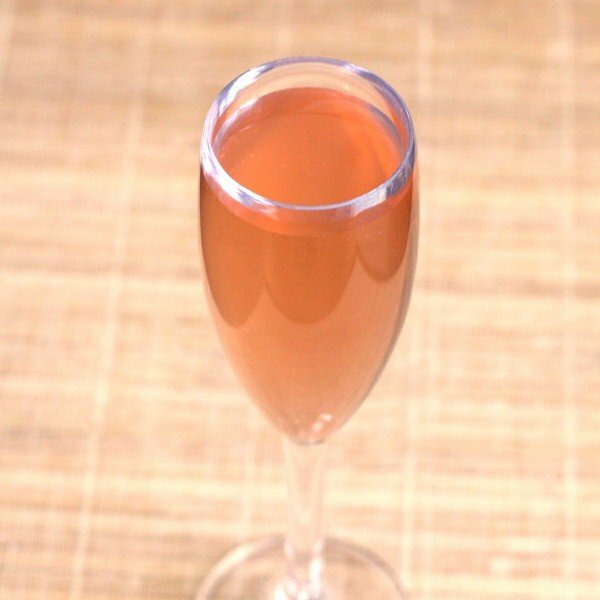 The original recipe came from Venice and was simply two parts Prosecco (Italian sparkling wine) to one part white peach puree with a touch of raspberry or cherry juice, which gave the drink a unique translucent pink hue. Since then, the recipe has developed a number of variations, largely because white peaches weren’t available everywhere at all times. Now you can buy bottled peach puree specially made for Bellinis, or you can use canned fruit to make a puree yourself. I’ve included the standard recipe (peach puree + Prosecco) along with a version that uses fresh or canned fruit ingredients. The Bellini is a delicious alternative to the ever-popular Mimosa, especially if you’re wanting something other than orange juice. The peach puree is relatively unique, with a less tangy flavor than orange juice. It’s light and delicate, and goes with almost anything. It’s an ideal brunch drink, but it’s just as delicious served at a dinner party as a light drink guests can enjoy with appetizers or finger foods. For a non-alcoholic treat, check out my mocktail version. The Bellini is one of the simplest champagne cocktails out there, with just two ingredients. It blends delicious peach puree with champagne for a wonderful, lightly fruity flavor. I recommend a Prosecco or dry champagne, but you can use any champagne you like. Now fill the glass slowly with Prosecco or champagne so it stirs up the puree. If you haven’t got access to peaches and raspberries to puree, here’s a version of the drink that uses all bottled and canned ingredients. Remember: this one will pack a much bigger alcohol wallop than the traditional version. Mix everything but the champagne together in a chilled flute glass. Add the champagne, stir and serve for two. WHERE CAN I FIND THE COCKTAIL MIXER PEACH BELLINI AT THE LIQUOR STORE HER IN MEMPHIS,TN. Try Kroger’s or Publix, or any regular grocery store. They’re in the “cocktail mixers” area, because they don’t have alcohol in them. would like to mix at home. Where can I find. Your peach Bellini in San Jose, CA. I was hoping to find some for this weekend. I don’t live there, so I don’t know. Check your grocery stores, or order it on Amazon Prime and it’ll get there by the weekend. I always used to make this with fresh fruit puree, but I started buying the bottled stuff and it’s just as good. I make my bellinis a little different I take Peach Brandy Put a peach in the Brandy and freeze it. ask pls: is it still safe to drink the spiced coctail? That’s a tough question. A “best before” date isn’t the same as an expiration date. “Best before” means that AFTER that date, it may lose flavor or something. Not necessarily that it will make you sick. Although it might. But in my experience, I’ve opened up some bottled mixers that were months past the “best before” date, and they had no flavor, so they would have ruined my drink. So it might be safe to drink (but I don’t know for sure! ), but also ruin your drink. If you open it, I’d definitely smell it first. If it smells bad, I’d throw it out. If it just doesn’t have much scent, I’d assume it wouldn’t be any use in a drink.